Email remains one of the most effective digital marketing tools. But B2B email marketing is only as effective as your content and the list it’­s sent to. Symmetri works with you to define your messaging and frequency goals, implementing CTA testing strategies and lead generation efforts. As a result, we can grow your list and improve the quality and effectiveness of interactions you have with your customers. Thousands of dentists x 1 great product. 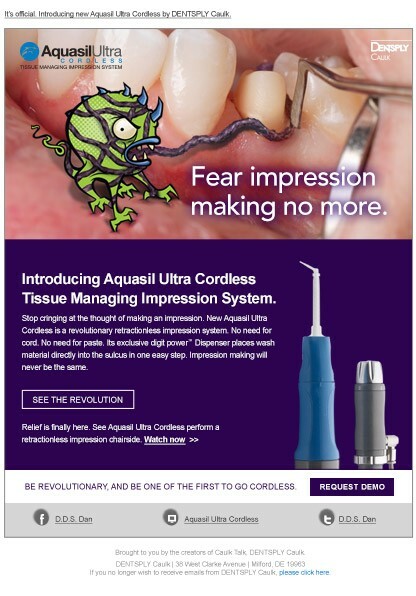 Aquasil Ultra Cordless, an exciting new dental product, is revolutionizing the impression-taking procedure. As part of the launch campaign, email marketing was utilized to create awareness of this new offering, drive product demonstrations and hit aggressive revenue goals. A series of emails was created to educate dentists on the benefits of Cordless. They included procedural insights as well as testimonials from early adopters. Consistent email communications contributed to improved direct load traffic (153% higher during email campaigns) and organic search engine traffic (55% higher during email campaigns). This program was instrumental in driving over 800 leads in less than four months.